Eragon soon discovers that the stone is an egg when a dragon hatches from it. He raises the dragon in secret and pesters the local storyteller, Brom, with questions on the fabled dragon riders whenever he’s puzzled by the creature. He names the dragon Saphira, after learning of the name from Brom. Saphira grows quickly and the two—dragon and Eragon—form a strong bond. They are able to communicate telepathically. However, Eragon’s idyllic affair with Saphira does not last. A pair of odd individuals visit the village asking about the stone and soon work their way to the farm where Eragon lives. They torture his uncle for answers on the whereabouts of the stone. Though Eragon tried to save his uncle by carrying him to the village to have his injuries nursed, his uncle passes away and Eragon leaves soon after in pursuit of the strangers. Brom accompanies him on the chase and informs him that the strangers are grotesque creatures called Ra’zac that are known for killing dragons. The story picks up here as Eragon travels across Alagaesia with Brom and Saphira in pursuit of the Ra’zac. Along the way, he learns more about the evil king, Galbatorix, who rules Alagaesia, and the rebel group, the Varden, that is trying to usurp him. Brom also teaches him about the dragon riders, how to fight with fist and sword, how to read and use magic, and even a bit about his ancestry. Brom knew Eragon’s mother and since Eragon is an orphan who knows nothing about his parents, he is eager to learn more about them. His adventure carries him to various cities in Alagaesia—the port city, Teirm; Dras-Leona, which is a city south of Eragon’s village that has an unsettling religion that honors the Ra’zac; and Tronjheim, a dwarf city in the mountain Farthen Dûr, which houses the Varden. He encounters various situations that robs him of his naiveté and meets numerous characters that leave an impression—the odd witch Angela and her aloof werecat Solembaum; the resilient Murtagh; and the alluring elf, Arya, amongst others. With his dragon, Eragon must fight to protect the Varden from a Shade (a sorcerer) and the infiltration of an army of urgals. I hated the movie but this still is cool. My first reading of Eragon was a splendid experience. First, there was the matter of the cover that tantalized me whenever I saw it sitting on my cousin’s bookshelf. I love fantasy in all media and a dragon on the front of novel is enough to tempt me to peek beneath the cover. Back then (in middle/high school days), it took a while to build up an interest in the story. I found the beginning boring but soon after, the story took off as the plot raced ahead at a steady stride. I liked the twists and turns of the story and I completed my reading eager to know what happens next. It was after completing the novel that I discovered Paolini was only 15 when he began writing it, which doubled my appreciation of the story. I thought that was a great feat for a teen and I dreamt of doing the same. Upon completing this story a second time, I realize that my reaction has dampen somewhat, which sours my overall experience. I rather the elation I felt upon completing the first read to the touch of dissatisfaction I currently feel. Now I think the story is okay, a bit less than average. Again, it takes a while for the plot to get going and for me to develop an interest in the story. I think that’s because Paolini uses those first chapters to lay the foundation of the story so not much happens except Eragon finding Saphira’s egg and learning about her, which is okay, but Paolini’s writing style, which is a bit spare on the details, makes the narration dry. My knowledge of fantasy novels has expanded a bit since my first reading and I now notice how old and overused Paolini’s structure is. As some would say, Eragon is the same old farm boy realizes he’s special and gain super powers to save the world story. Though overused, I am a sucker for such stories and I still think Paolini carried it off well. Such stories have been told time and again since Tolkien’s LOTR series and even before that. I think people find such stories appealing because it shows that everyone has something special inside him and anyone can achieve greatness. It’s an attractive thought. But I think Paolini falls short on Eragon’s inexplicable desire for Arya. Sure he’s a teenager and Arya is a hottie so he’s instantly attracted and obsessed with her but he acts as one in love and I think those feelings developed too quickly to be believable. Still, it’s possible that this is simply an example of love at first sight but for all that has occurred in Eragon’s life, I think he should have exercised more caution. How does he know it’s not some trick of the Shade or Galbatorix that shows him Arya in his scrying? (Maybe I’m just reaching here.) I also think Eragon’s suspicions of Murtagh as possibly evil while they travelled to the Varden were uncalled for though it was needed to sow seeds of distrust towards Murtagh in Eragon and Saphira to prep them for what is coming. Eragon has no qualms about the soldiers who were probably killed or hurt when Murtagh rescued him from the Shade but he feels bad for the bandit that ambushed them in the forests of Farthen Dûr. This makes no sense to me. However, I believe Paolini does a good job on his character development and I like that they are not all either entirely good or bad. There are a few gray ones who fall in between those polar poles of morality. I appreciate the moral complexity Paolini infuses in the story in the form of Murtagh and the situations that Eragon encounters. Often, Eragon and Saphira have to question their moral standards, which pushes them past their innocence and inexperience to face the truths of the world. They ponder the validity and morality of their actions since what they do shapes who they will become. 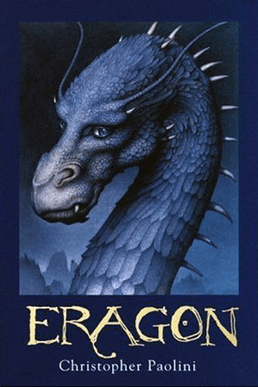 Eragon is a good book and I would recommend it to young readers interested in fantasy novels. It can be used as a starter text; one that young readers can grow with as the characters develop throughout the series. I did not enjoy it as much this time but Eragon does have potential and I think it would be a better read if it were a tinge more descriptive and had cut back on the journey scenes used to relay backstory/history and the like. Of course, it was a joy to once again meet my favorite characters—Angela and her werecat, Solembaum. Along with Nasuada and Murtagh, Eragon’s cousin, Roran, is another favorite of mine. We get to read from his perspective in the sequel, Eldest, and watch him grow from a young man into a warrior and leader. There’s much to look forward to in this series. I might be swayed by the characters to reread the other books. “What is the worth of anything we do? “Sometimes I wonder if we can ever understand the true motives of the people around us. They all seem to have secrets. This entry was posted in book reviews and tagged childrens books, Christopher Paolini, Eragon, fantasy novels, Inheritance Cycle, swords and sorcery, Varden, ya novels, young adult novels. Bookmark the permalink. Oh yes! I often dream up what happens in the spaces Paolini leaves. I both enjoy and dislike doing that. Sometimes I just want to know what’s in the author’s head; other times, I’m glad for the freedom. I debated about whether I should mention that Paolini’s style is dry in this reflection since I often complain about Robert Jordan’s descriptive style in his Wheel of Time series. I thought I might seem hard to please lol. But I agree with you: description is overdone in fantasy. P.S. I thought the film was AWFUL too. Ah! That’s exactly how it seemed, as if he just “stuck” the romantic interest in the story without melding it into the story. Hmm…maybe it would of been better if Eragon’s romantic feelings developed after he rescued Arya. Lol. I saw the show a few days ago and couldn’t bear to watch the entire thing. Too many changes and cuts.